Let’s see what’s good in ReSharper 7 in addition to support for Visual Studio 2012 and WinRT development. 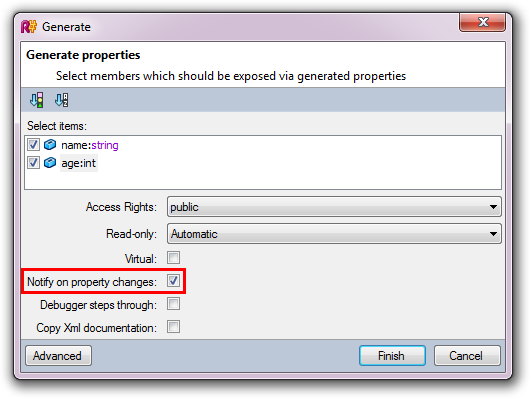 Ever since the release of Windows Forms, the INotifyPropertyChanged interface has been used by developers to allow properties to notify whoever needs to know (typically, the UI) that they have changed. Support for change notification, which nowadays appears in many core (WPF, Silverlight) and third-party frameworks, has been frequently requested on the ReSharper issue tracker and, in the 7.0 release, we are happy to oblige. Here’s what we’ve got in store. As soon as you indicate that a class implements INotifyPropertyChanged, ReSharper offers a quick-fix that not only implements the interface members, but also provides a default implementation of the method as well as the needed event. With the interface implementation in place, you can navigate to a property and convert it to a field+property declaration that calls the notification method. The property can be an auto-property or a field-backed property provided the assignment to the backing field is the last expression in the setter. Important note: in order to get context actions related to an implemented INotifyPropertyChanged interface to show up, code annotations need to be added to the project. You can find the default implementation in ReSharper|Options|Code Annotations. These annotations contain the definition of the [NotifyPropertyChangedInvocator] attribute, which is used to decorate the method that is responsible for firing the event. Also note that this is only necessary if you’re implementing INotifyPropertyChanged yourself, and is not required if you are inheriting from a framework class that implements it. In addition, when you decide to call OnPropertyChanged manually, ReSharper will offer a completion list for that string parameter. Not all implementations of INotifyPropertyChanged are identical. Third-party application frameworks often have their preferred way of notifying on property changes, and are shipped with corresponding base classes that framework users are encouraged to inherit from. One major difference is that certain frameworks prefer to use a lambda expression instead of a string literal as a parameter to the notification method. 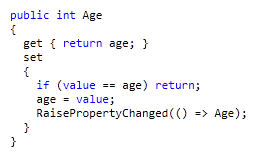 As you can see, ReSharper is attuned to the specifics of the parents of the containing class, and is capable of presenting all of the available choices. 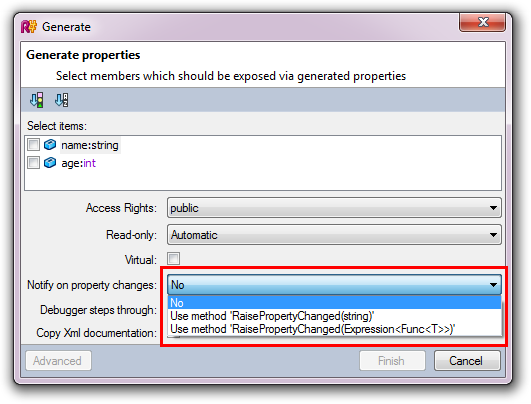 This entry was posted in How-To's and tagged INotifyPropertyChanged, MVVM, ReSharper, ReSharper 7, WPF. Bookmark the permalink. @Alex what kind of features would you like ReSharper to provide with respect to dependency properties? wuut, how come i didn’t know that. I’m running R#7 Beta but can’t see the feature, is it in a newer release? @Corrado: you have to annotate your RaisePropertyChanged or equivalent method with the new R# [NotifyPropertyChangedInvocator] if you’re not using one of the framework listed in this blog post. Hi, What about C# 5 Caller Information support? @duile at the moment, ReSharper does not support this mechanism. I have created a feature request for it — please feel free to vote for it. Thanks @Dimitri. I have voted it. How about support for [CallerMemberName]? Please feel free to create a feature request on this. Will Resharper pick up on the fact that “NotifyChanged” is the implementation of INotifyChanged, instead of “OnPropertyChanged”? Will there be some sort of configuration available for this? @Joe: see my previous comment, you just have to annotate NotifyChanged with the attribute [NotifyPropertyChangedInvocator] from JetBrains.Annotations to make R# recognize your method. How do you enable this feature? I don’t get that option on my resharper 7! @Jason: you need to annotate the event-firing method with the [NotifyPropertyChangedInvocator] attribute. You can get this attribute by pasting code annotations into your project – see ReSharper|Options|Code Annotations. I’m not seeing any of this support in VS2010 + Resharper 7. Is this a VS2012 only feature? @snort, this feature not only VS2012 feature, it works even in VS2005. Looks like you missing R# code annotation on event-firing method. @SledgeNZ, [CallerMemberName] support is already implemented and will be publicly available in next minor release. Thx for your feedback! Nice feature, but you should really just point everyone to use NotifyPropertyWeaver. Free, simple, and results in significantly cleaner code. Once you’ve tried it you’ll never go back! I’m using Resharper 7 and MVVM Light. When I use class ViewModelBase in which its super class is ObservableObject which implements INotifyPropertyChanged, so therefore in my view model its inherited the implementation and events.So I should be able to alt+insert to insert properties that implement INotifyPropertyChanged, currently I dont seem to be able to and I’m having to do this manually. What am I doing wrong? for the love of everything good and right, i just wasted 90 minutes of my life figuring out this simple thing. On R# 8.2.0.2160 this feature doesn’t work. I derive my class from another one which in it’s turn implements INPC. Not getting the appropriate options in the alt+enter menu here either. ‘to property with backing field’ but no INPC-related things. Would also be nice to be able to refactor to custom implementations somehow, such as MVVMLight’s simpler Set(ref _backingField, value); method. Are there any news with this issue?